The usage of solar panels in India keeps on increasing with every passing year. Solar panels work to produce free electricity, converting sun’s energy. One time investment of installation of solar panels will relieve you from huge electricity bills for forth-coming years. Also, investment cost is not completely borne only by you, as government is providing a subsidy to make the most out of natural resources. In this scheme, the benefit that has been declared is that farmers can install the solar panels to use it for irrigation, as well as make money while selling the leftover energy to the grid. The additional energy from these panels can make farmers earn more while selling it to the State Government. Rs.7 per unit rate of electricity, the government will procure for first 7 years, remaining 18 years, the rate will become half of it i.e Rs.3.50. 33 districts including 12,400 farmers will be covered under this scheme while 137 feeders provide solar power. Low solar panel purchasing Cost: Solar panels require a big investment, however, 5% of the total amount will be paid by farmers, remaining 60% will be borne by the government via subsidy and 35% will be compensated by farmers via low-cost loans for 7 years, added State Government. Earn while selling leftover electricity: Sell extra energy at the cost of 7 per unit to the government for 7 years. Moreover, for next 18 years, farmers will be paid Rs.3.50 as per unit. Through this scheme, farmers will be having an additional way to earn money, with a low investment on installation of solar panel, since the cost of installation will be recovered within a span of 8 to 18 years. 12 hours of getting electricity for irrigation will be possible after the implementation of this scheme since as for now farmers are receiving only 8 hours electricity. Presently, Government providing a subsidy to Gujarat farmers for irrigation while spending around 4500-5000 Crore every year, because, only 50 paise per unit payment has been made by Guajrat farmers to Govt. However, after implementation of this scheme, the expenditure will come down as Govt. saves big. To begin the pilot stage of solar power generation scheme, Rs. 870 crore budget has been allotted by Govt. initially. Moreover, irrigation through water pumps requires 177 megawatts to generate 1,42,000 horsepower of energy in the pilot stage. In a nutshell, till the year 2022, installation of 100 GigaWatts (GW) of energy capacity has been targeted by Govt. Moreover, Modi’s vision of “Doubling Farmers income by 2022” seems possible with this solar step. For the first time in Indian history, Gujarat state government is giving farmers the power to produce electricity by installing solar cells. 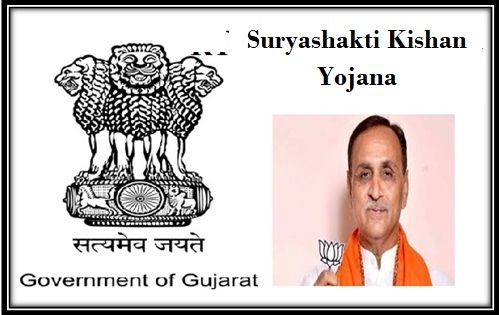 Gujarat CM Vijay Rupani also said that apart from meeting their needs, state farmers will be able to earn extra money by selling surplus electricity to any power company, operating in the state. For this, these companies will offer Rs. 7 for each unit of electricity sold. For the time being it will be implemented on pilot basis in 33 districts. For this, state authority will have to shell out Rs. 870 crore. State and central governments will jointly offer 60% of the total cost of installing solar cells, while farmers need to arrange only 5% of the total expenditure.